Smooth, creamy chocolate goodness blended with premium Organo™ coffee make this a decadent treat you can enjoy every day. 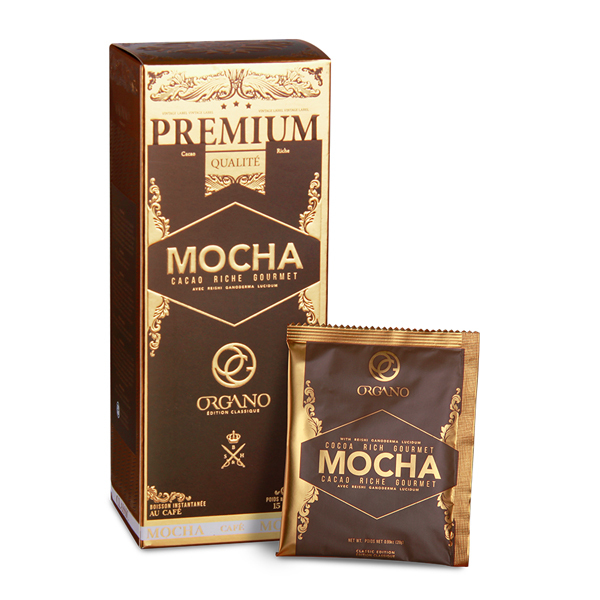 Organo™ Gourmet Café Mocha is a delicious treat that combines the rich, smooth flavor of chocolate in a creamy cup of premium coffee, with Ganoderma lucidum. Smooth and satisfying, it’s a delicious way to start your day, or have as an after dinner drink or mid-afternoon pick me up. 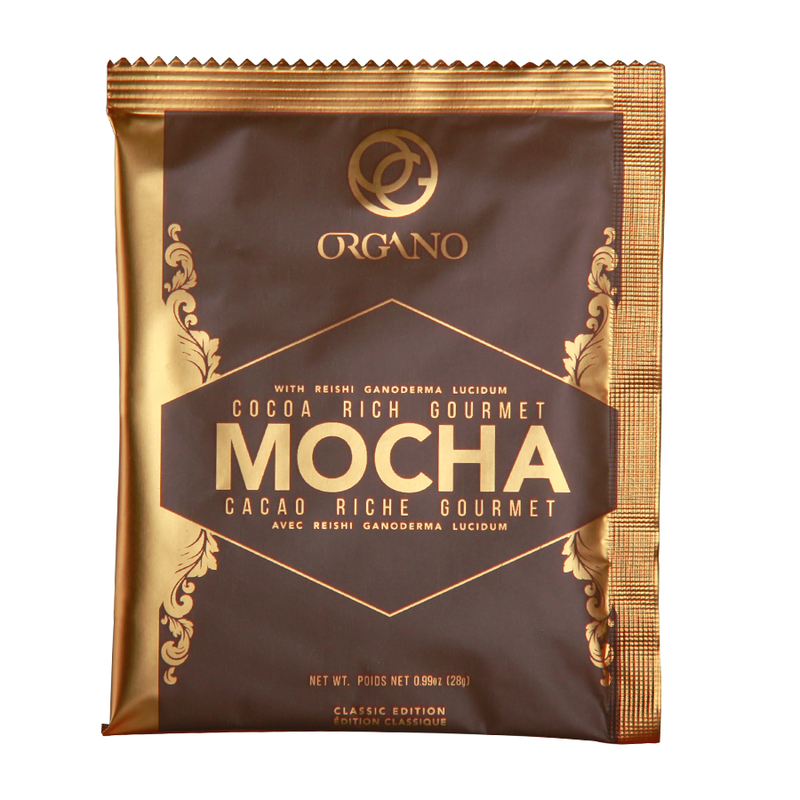 ORGANO™ Gourmet Café Mocha is a blend of our quality coffee with the finest cocoa and Ganoderma to achieve a rich, chocolately mocha flavor. Enjoy after a meal or as a tasty afternoon caffeine boost. ORGANO™ Café Mocha balances a decadent coffee with the perfect amount of creamer and sweet flavor. THIS delicious drink is enchanced with the nutty back note of Ganoderma mushroom. Coffee-- a full tasting, instant gourmet coffee. Cocoa powder -- the rich coffee is mellowed with the sweetness of creamer and high-quality cocoa powder. 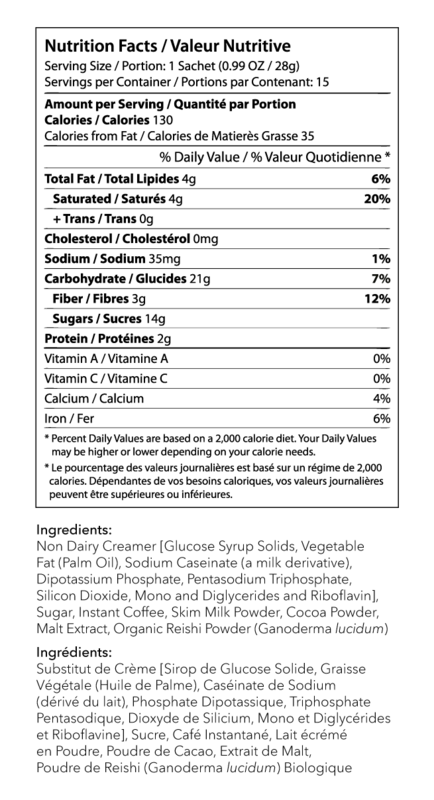 Fiber -- Each sachet of ORGANO™ Café Mocha has 3 gm of fiber. Ganoderma lucidum -- Known to many as the red Reishi mushroom, this acient Asian herb offers a nutty flavor and additional healthy ingredients including triterpenoids and amino acids. 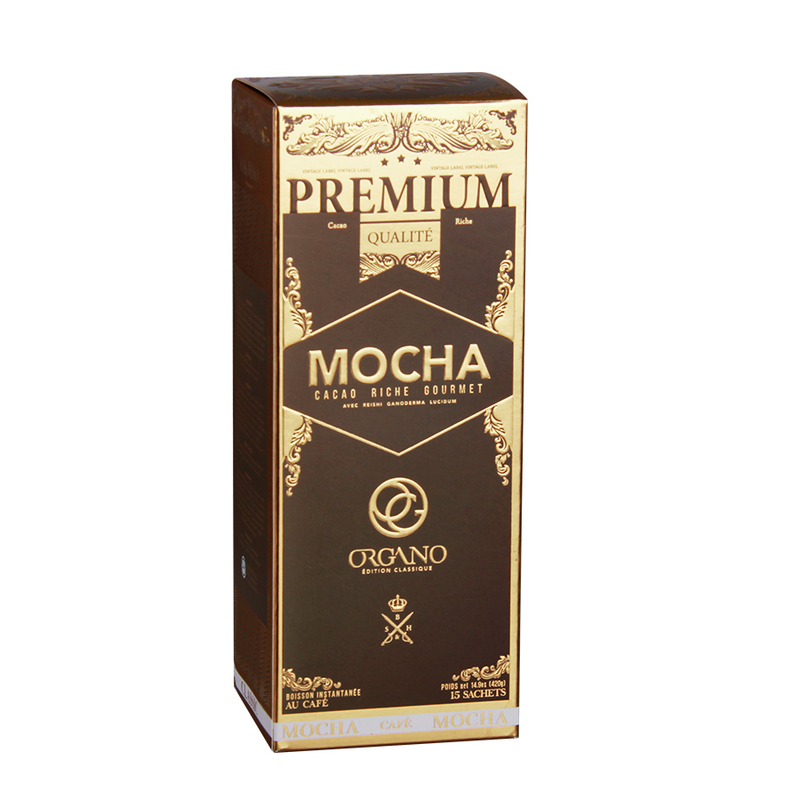 Creamer -- For an extra touch of sweetness and decadence, creamer is added to ORGANO™ Café Mocha. Flavanols, a plant nutrient found in tea, red wine, blueberries, peanuts, apples, and pears, is plentiful in the seeds of the cacao plant. Those seeds are planted, harvested, irrigated, fermented, dried, and crushed -- all by hand -- into cocoa powder which is then used to make chocolate. The flavanols available in cocoa powder are so powerful in helping the body aid circulation that the plant's name literally means "food of the gods" in Latin. Empty 1 sachet into your favorite cup, fill with hot water, stir and enjoy! Can also be mixed, and then add ice for a creamy cool coffee treat.